Some of the most interesting and often desirable historic arms are those from the antebellum south, made or retailed by southerners in the decade or so leading up the outbreak of the American Civil War. While many of these arms were simply northern made arms that were marked by the southern retailer, or more often foreign imported arms marked by their sellers, a select few were actually produced by southern craftsmen. In our recently published book Confederate and Southern Agent Marked Shotguns(2017), we discuss numerous examples of English and Belgian made shotguns that were imported and sold in the south with the local retailer marking. Southern retailer marked English imported revolvers and pistols are well known as well, although hardly “common”. What is of particular interest are those arms that were domestically produced and marked by their southern retailers, representing the typical firearm found in a middle class or wealthy southern home on the eve of Civil War. While nearly all antebellum period shotguns sold in America were imported, pistols and rifles were produced domestically, and provide an interesting window into the pre-war south. 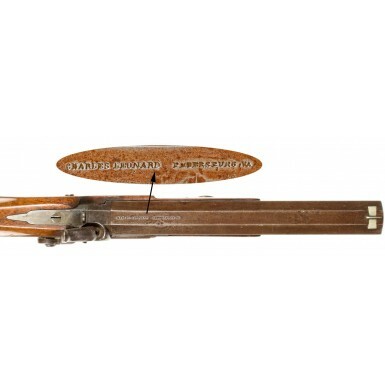 Merchants and Sportsmen can always find the largest assortment in the State of Double and Single Guns, Rifles, Pistols, Bowie Knives, Sporting Apparatus, Fishing Tackle, Walking Canes, Diamond Grain Powder, Cutlery and Fancy Articles of every description. N.B. All kinds of firearms manufactured and repaired. Obviously, the claim that Leonard offered the “largest assortment in the State” when it came to firearms was likely somewhat of an exaggeration, but clearly the man became quite successful in his chosen field. By 1860, the Census revealed that 33 year old Charles Leonard, who was listed as a “gunsmith & jeweler” had amassed a personal estate of $5,000. This translates to more than $150,000 today based solely on inflation but was the economic equivalent in 1860 to more than two million dollars today! His business not included firearms that were produced locally (by himself or staff), but those that were imported as well. Like his contemporaries Hyde & Goodrich in New Orleans, he also imported a wide variety of goods from England, possibly relying upon old family ties to smooth the way for the business transactions. The last two items are particularly interesting as they were certainly not domestically produced items, especially in the south. Based upon our research for the book The English Connection - Arms Material and Support Furnished to the Confederate States of America by Great Britain, we found that England was the primary source for Confederate “scientific instruments” and optics. The fact that Leonard was still able to obtain such items for retail during the summer of 1863 is certainly testament to his business acumen and international connections. Other interesting receipts include one from January of 1863 for “repairing compasses”. Others form that same year exist for the sale of “1 Pair Gold Epaulettes”and another for several dozen coat buttons, all of which were almost imported items like the compasses and spy glasses. Like most of the south, and the Richmond – Petersburg area in particular, the end of the Civil War left the economy and landscape in ruins. However, Leonard took this as a business opportunity and rebuilt his business into one that was a Petersburg tradition well into the second half of the 20thcentury. It was with great sadness that the writer of the June 1968 article cited above looked at the sale of the Charles Leonard Dry Goods (Hardware) building, equating it to the end of an era in Petersburg. 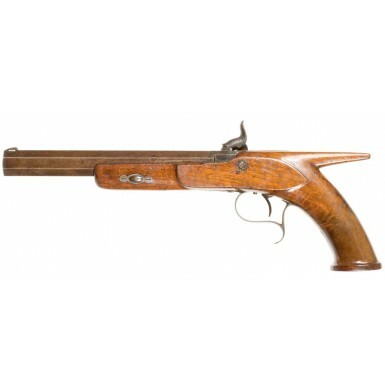 The gun is a lovely example of a saw handled, percussion target pistol. It measures 14 ½” in overall length with an 8” octagonal barrel that measures 1” wide at the muzzle with 3/8” wide flats. The pistol is nominally .52 caliber, measured land to land, and is deeply rifled with six grooves that measure about .56 caliber groove to groove. The deep grooves certainly suggest the gun was intended for use with patched balls. The barrel has a “break off” or “hook” breech, one of the features that suggested that the barrel might have been of English origin. These are features typical of high grade English arms of the period. 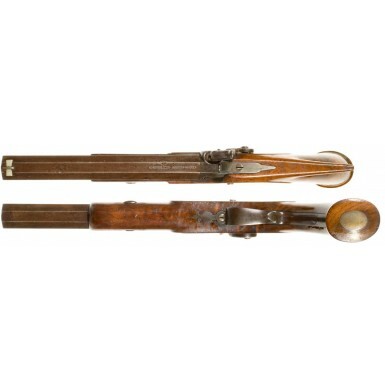 The barrel is retained by the breech hook and a single wedge. The wedge is surrounded by a German silver escutcheon. Another German silver inlay is present as well, a 1” x ¾” oval on the base of the grip that was probably intended for a monogram, but which is blank. 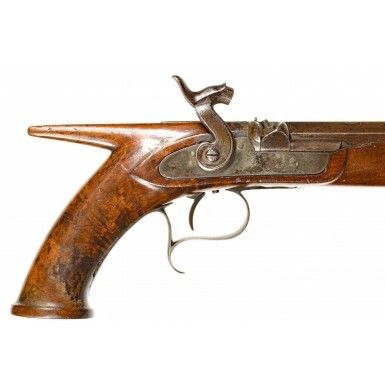 The balance of the pistol is iron mounted in the southern style with the triggerguard featuring a finger spur and a rudimentary pineapple finial. All of the mountings are plain and unadorned, without any engraving or embellishment. The trigger is adjustable, another high grade feature not often found on pistols of the period. The sights are a simple notched rear, mounted on the breech tang, and a dovetailed German silver front blade. 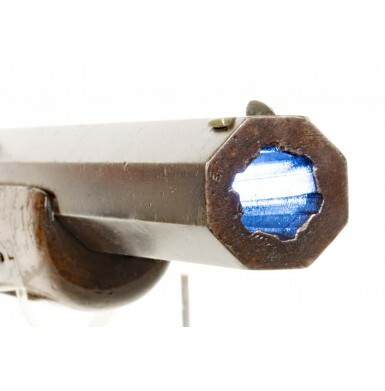 The pistol was finished with a browned barrel and furniture, while the front action percussion lock was color case hardened and is retained by a single screw. 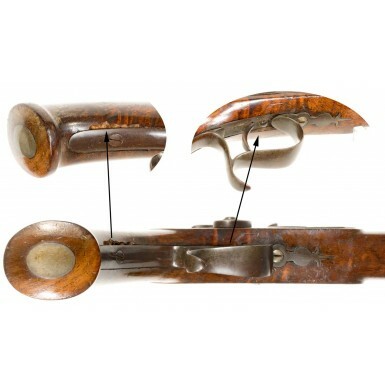 The gun is stocked in a particularly well figured piece of walnut that would probably be considered root wood by the grain and figure in the grip; again, very reminiscent of fine English pistols, particularly from the previous century. 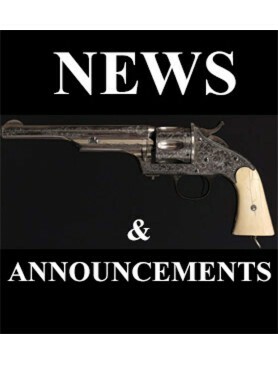 The gun is a unique dichotomy of very high quality features and craftsmanship, and simple and solid southern gun making. For a modern hand gun analogy, I would compare it to a custom carry M1911 pistol from one of the top makers like Wilson, Ed Brown, Nighthawk or Les Baer; all of the highest quality parts and craftsmanship with none of the “features” that you don’t really need for a working handgun. This gun is exactly that. High quality construction with a seriously high quality lock with adjustable trigger for a fine shooting gun, but not decorated beyond the natural beauty inherent in quality work. 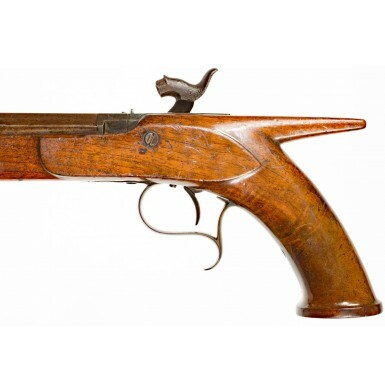 This was a gun that was intended to be used by a serious shooter, who was not concerned with decorative features that added no functionality to the pistol. The gun remains in about FINE overall condition. The barrel retains a small amount of thinned brown, primarily in protected areas, which has mixed with a very attractive and evenly oxidized brown patina that make the gun appear to retain more finish than it really does. In reality, the barrel probably retains less than 10% of the brown but displays as if much more were still there. The breech tang and lock were color casehardened and both retain some traces of that finish. 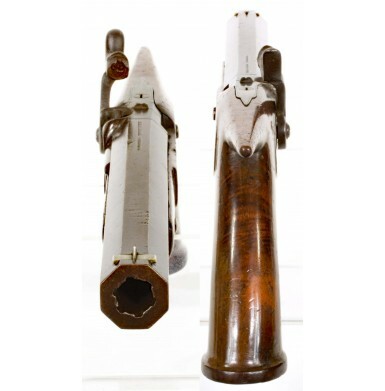 The breech tang probably retains 10%-20% and the lock retains some traces in the protected region where the hammer neck kept the lock from fading completely. The balance of the lock has a mottled, dull light and dark gray patina that suggests the original mottled case colors. The metal is mostly smooth throughout, with some scattered light surface oxidation, some flecks of minor roughness and some small areas of light pinpricking, as well as some light pitting around the muzzle area, the bolster and on the hammer’s nose and neck. All of this is indicative of a pistol that was really used. The bore of the pistol is about VERY GOOD+, retaining fine, crisp rifling its whole length. The bore is moderately oxidized with some light pitting along its length and a couple of small patches of more moderate pitting here and there. The lock is mechanically excellent and functions perfectly. The trigger pull is crisp and rather light for a percussion pistol and would likely have enhanced the accuracy and shootability of the pistol quite nicely. The figured stock is very attractive with a nice hand rubbed oil finish that remains mostly intact. The stock is solid and free of any breaks or repairs. There is a small area of light chipping present under the gripstrap, along the rear tang of the triggerguard. Here an area about 1/16” wide and 2” long has chipped away, likely due to the inherent weakness of the highly figured wood. Amazingly the grip is not cracked through, as one would expect with this level of figure. There is also a tiny chip of wood missing forward of the lock, along the top edge of the stock where it meets the barrel. This is a slightly angled chip, about 1/2" in length. The stock does show a number of small scattered bumps, dings, scuffs, scrapes and light surface mars, but nothing indicative of abuse or neglect, just actual handling and use. There is also an area of finish wear on the obverse grip that has given the wood a darker patina in this region. Overall this is a really attractive example of a fairly scarce Charles Leonard, Petersburg, VA marked pistol from the period of the 1850s. 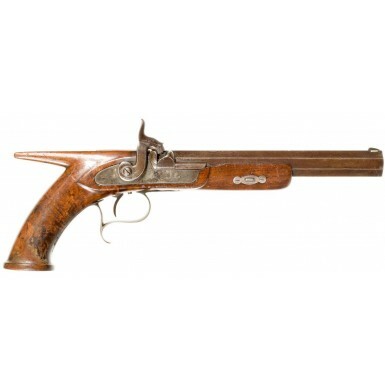 As Leonard was not truly in business on his own account until circa 1845, the pistol can be no earlier than that, and most likely post-dates his entry into the trade by at least a decade. 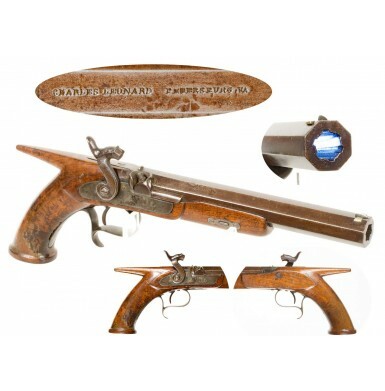 As noted, the gun is extremely well made, a very high quality arm without any unnecessary decoration, but with an exceptionally fine lock mechanism and quality parts throughout. The classic execution of the design with iron mountings is very southern in its simplicity and functionality. We were fortunate to find four examples of Charles (or “C”) Leonard, Petersburg marked shotguns to illustrate in Confederate and Southern Agent Marked Shotguns, which can be found on pages 248-255. This is, however, the first time I have had one of his pistols to offer for sale. Unlike the shotguns, this is not an import arm, but a high quality southern pistol from the eve of the American Civil War and from a city that saw some of the most brutal fighting of that war and the birth of modern trench warfare.